Mommy, I want you to make me something pretty! My little pumpkin was sick for 4 days straight. I hate seeing her so unhappy and cranky, but I love snuggling with her, when the only thing that makes her better is my kisses and my hugs. 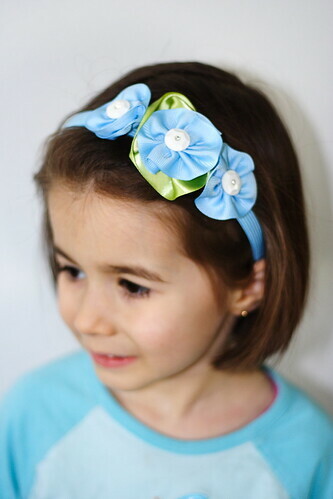 A pretty headband, to match her blue outfit ( today we even fought over an old light blue jacket, that she insisted on wearing to school, because it matches her headband). A headband, 3 buttons and 1 long green piece of ribbon, 3 smaller blue pieces of ribbon and we had a pretty headband that sparkles. Her eyes sparkled too and that was the best part.